December 29, 2015 Robert W.
Cheap discount banners are a great way to promote your business through low cost vinyl banners. Cheap discount banners give a business an opportunity to market their products at their location at a fraction of the cost of print ads. In these challenging economic times for businesses, they need a way to market their products and services without spending a fortune on advertising. Cheap discount banners allows a business to advertise products unique from the competition and get them in the publics view. For example, a local Mexican fast food place in town uses cheap discount banners to market different specials that they have. For a few days, they will have a 3ft x 5ft banner in front of their store ( so the people driving past the store can see their banner) advertising a breakfast burrito at $3.99. The store can be assured that for the next few days, local people will see the banner and be coming into the restaurant for burritos throughout the day. The restaurant owner will then change out the banner to taco Tuesday specials, Chicken Wednesday and so forth. The whole idea is that the owner constantly rotates the cheap discount banners so that the public always sees new food specials. Cheap discount banners are made with tough, 13 ounce banner material and printed directly on the banner with specialty inks that are designed to prevent fading ( even in the hot Las Vegas NV. sun) The banners cost a few dollars a square foot, so a 3ft x 5ft vinyl banner would be around $30.00. These tough vinyl banners can be sued over and over again with simple caring instructions. Also, the banners come with grommets on the banner so that they can easy be installed by professional or yourself in a easy manner. These cheap discount banners will get your business noticed. Custom foam board signs are being used very successfully by Las Vegas retailers to increase their in store sales. Every time we walk into a Las Vegas gas station and pay for your purchase, you see point of purchase advertising to entice you to spend additional money on merchandise. What are Custom Foam Board Signs ? Las Vegas retailers love these signs and they are very popular at grocery stores, convenience stores and gas retailers. At every register, there are these custom foam core board signs that prompt you to buy their merchandise while you are waiting to pay for your purchase. They are very successful in this goal as retailers will pay a premium to be able to market their items to you in these locations. They peddle anything from the popular drink Gatorade to M& M candy bars. Custom foam board signs are also popular at the Las Vegas conventions and exhibits. They can be set up very quickly on easels and offer a very professional background display to help sell their wares. These custom foam core board signs are not expensive, with the 3/16 board selling at around $4.oo to $6.00 a square foot and the 1/2 ” thick foam core board signs selling for $6.00 a square foot and up. Custom foam board signs can be bought at you favorite sign shops in Las Vegas or online to help you improve your in store sales. December 28, 2015 Robert W.
Las Vegas retractable banner signs are one of the most popular signs at Las Vegas conventions and trade shows. The reason being is they are so compact and make for big signage. Las Vegas is the number one destination in the world for conventions and trade shows. it is the place where most industries want their attendees to go because of all the fun that Las Vegas offers. That being said, Las Vegas has a very large sign industry to support the signage needs of the conventions. Las Vegas retractable banner signs are not very expensive. A 33″ x 78″ retractable banner stand with adjustable pole is under $100 and several of the x stand banner stands can be purchased for under $50.00. These Las Vegas retractable banner signs come in full colors and an have logos and pictures printed on them as well. They come in a variety of sizes ( width and height) to accommodate most needs. When these Las Vegas retractable banner signs are placed side by side, they can create the illusion of being one sign and be very impressive in their size. They are not terribly complex to make and usually just take a few days for a final product to be ready. 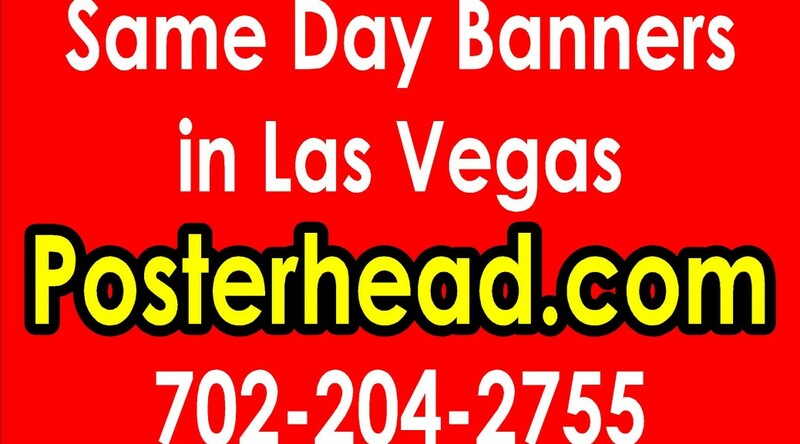 Las Vegas retractable banner signs are available through local sign shops in Las Vegas or online. Las Vegas 89107 custom banners are great for stores that want to differentiate themselves from the competition. Custom banners are a way of getting recognition from vinyl banners that are generically made. Las Vegas 89107 custom banners in many cases can be made at or lower than pre printed vinyl banners supposedly purchased on the internet at discount prices. Las Vegas 89107 custom banners allow for a business to add that extra special touch on their banner to set them apart from the competition. It could be as simple as your logo or picture or maybe even certain colors and fonts that your store is known for and customers have come to appreciate. Las Vegas 89107 custom banner are full color and you can have as many pictures, logos, colors on the banner as you like. The banners come with grommets that are placed approximately every 2 feet so that the banner is easy to hang and install. The vinyl banners are printed on a 13 ounce banner material with eco solvent or latex inks that allow for the custom banner to be placed in the hot summer sun of Las Vegas without fear of fading ( which will happen quickly without the right specialty inks or printed with lower cost inks). The banners cost around $2.00 a square foot and many times you can find specials on the banners at various sign shops in the Las Vegas area. For example, this You Tube video, https://www.youtube.com/watch?v=iPARROEG90c shows a local sign shop having a special on a 3ft x 8ft custom made vinyl banner for under $40. These custom banners are so cheap than many businesses buy several of them and simply rotate the custom banners so that there is always a new marketing banner on their store promoting their products and services. 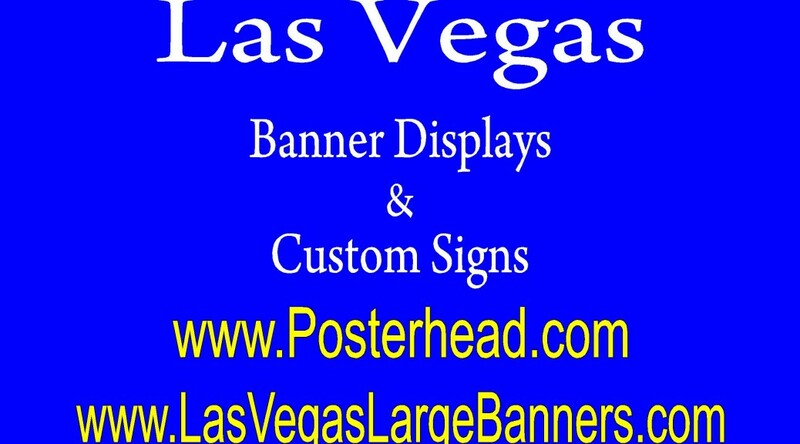 You can order your Las Vegas 89107 custom banners at any of the sign shops located in Las Vegas. Poster board signs are a excellent source of advertising for convenience stores and gas stations. These low cost poster board signs are very effective of reminding you of products and services that are available for purchase. These poster board signs are so effective for sales that many of the vendors like Pepsi, Coca-Cola, Gatorade, Hostess, etc. will actually print their own poster board signs for the stores and give them away for free in order to increase sales for the store and themselves. Many times, depending on the location and store, the vendor will pay money through bonuses or discounts for the right to even display their poster board signs placed at a certain location within the store. Poster board signs are different types. They can be simple as poster paper signs or vinyl prints applied to a foam core board of different sizes ( traditionally 3/16 or 1/2, but can be thicker ) and then many times laminated to provide a clear and shiny appearance. ( the laminate protects the print ) Other times, with the use of state of the art flatbed printers, the eco solvent or latex ink is applied directly on the foam core board and laminated . Either application is beneficial as the other and only a trained eye can determine the difference. The cost of the poster board signs varies from about $4.00 a square foot on the low side to about $9.00 a square foot on the high side. Many sign shops in the Las Vegas area have the ability to fulfill your requests for poster board signs. Poster board signs are very popular at the trade shows and conventions in Las Vegas ( banners being the number one signage) and consequently, your poster board signs can be made with the assurance of quality. Local stores love them as they make very good point of sale signs. December 26, 2015 Robert W.
Foam board prints are great for advertising products at stores and conventions to increase sales. They are very effective in point of purchase sales. They increase sales by making customers ware of products and services that are available through your business. Who Uses Foam Board Prints ? There are hundreds of businesses in Las Vegas using foam board prints and poster signs every day. One of the biggest users of these types of signs are grocery stores. Grocery store owners put these signs above areas like produce, bakery, deli, etc. to notify customers of low prices and sales on items in the store. Neighborhood convenience stores also use foam core board signs as a way to increase customer awareness and sales. Foam board prints are not very expensive. With the 3/16 foam core board, they cost around $4.00 a square foot. The 1/2 inch foam core board costs slightly higher. Many times, the foam core board will be laminated with a gloss finish to make it scratch proof and present better. Poster signs can also be laminated. Poster signs are cheaper and printed on a 8 or 9 mil poster paper that can be inserted into display stands or attached to walls that help customers be notified of merchandise availability. Foam board prints can be purchased online or at sign businesses in the Las Vegas area at very reasonable prices . These cheap and effective signs are guaranteed to increase your sales and bottom line. December 22, 2015 Robert W.
Las Vegas poster signs are made in the Las Vegas area by print and sign shops. These Las Vegas poster signs are used for a variety of purposes and a re a favorite with Las Vegas businesses. Las Vegas poster signs can be seen at most all the retail shops in Las Vegas. Retail shops will use them for point of purchase sales at convenient stores and many other types of retail facilities. You cannot go to a 7-11 and not be bombarded with POS signs at the cash register. These signs can be in many forms such as poster signs and foam core boards. Poster signs are printed on a heavy 8 or 9 mil poster paper and are very high quality and applied to walls or upright stands that they slide into. Foam core boards are printed on vinyl and then applied to foam core board of 3/16 or 1/2 thickness or sometimes can be printed directly on the foam board itself. They are then sometimes laminated so that they have a glossy, shiny appearance that prevents damage to the prints. This is important because if the poster sign is placed near the retail check out, many times children will play with them and accidently scratch the surfaces. Las Vegas poster signs are full color and you can have as many colors, pictures, logos you want on them. Las Vegas poster signs make great advertising because they are not expensive and you can usually install them yourself and save much money by doing it that way. Also, many times the vendor of the products you sell will give you promotional poster signs with their products on them to help you sell them ( and of course help increase their sells as well). Poster signs can be purchased online or at your favorite sign facility in the Las Vegas area at reasonable prices. Las Vegas Poster Boards For Business Presentations. Las Vegas poster boards work very well for business presentations and conventions. Poster boards are a printed vinyl applied to a poster board made with foam that is usually put on a easel or inside of a frame for display. There are many applications for Las Vegas poster boards. Las Vegas poster boards are used at the Las Vegas conventions where the exhibitor places them on a easel and includes them as part of his or her presentation. They act as a visual reinforcement to their marketing presentation and are quite popular with the convention crowd. These poster boards can be set up and taken down within seconds and used over and over again if stored safely. Las Vegas poster boards are used at business presentations throughout the world. They are relatively easy to set up and can be transported with ease. They make a wonderful backdrop sign for a visual reinforcement of what the speaker is trying to convey. Las Vegas poster boards are not expensive and can be used several times or ” one and done” and thrown away after their use. The most popular sizes are the 3/16″ and the 1/2″ . Sometimes the poster boards will be laminated and will have a clear gloss film on them that really makes the sign show well. In addition to poster boards, many people also use retractable banner stands for visual presentations al9ong with their display cousin, the x banner stand. This You Tube Video, https://www.youtube.com/watch?v=OkjZ9glitnU will further illustrate what a x stand banner stand looks like. These retractable and x stand banner stands are under $100 and can be used over and over again at presentations. Las Vegas poster boards can be found online or at you local sign and print shops in the Las Vegas area at very reasonable prices and made very quickly. December 21, 2015 Robert W.
Las Vegas foam core board printing is excellent for display presentation. A foam core board is usually one of two sizes, a 3/16 or a 1/2 “ foam core board. The foam core board is printed directly on by a large format printer or a large format printer printed on a vinyl and then it is applied to the foam board. Many times, the foam core board is then laminated over with a gloss application giving it a very professional appealing appearance. Las Vegas foam core board printing are used as displays and presentations at events. Many times businesses choose to use this type of product for in house presentations where a professional look is required or at sales presentations where the company wants to promote its products and services. Las Vegas foam core board printing is also used many times at Las Vegas conventions and trade shows. There are many trade shows and conventions held in Las Vegas and consequently, many vendors prefer to have their foam boards printed in the Las Vegas area rather than risk damage while transporting the foam core boards. The foam core boards are delicate and can easily be damaged if not secured properly. If secured properly, foam core boards can be used over and over again at different events. Speakers usually put them on display on a easel and they can be easily set up and taken down by one person. Las Vegas foam core board printing is not expensive as you might think. Generally, in the Las Vegas area, they start at around $4.00 a square foot and go up based on the thickness of the foam board. Las Vegas casinos are also a big user of foam boards as they make wonderful displays in the casinos. They generally use a 1 inch foam board for sturdiness and have it fit in a self containing stand. Las Vegas foam board signs are very popular at Las Vegas trade shows and conventions. They are also very popular at speaking events where you want to have visual displays to help support your lecture. Las Vegas foam board signs usually have a 3/16 backing or 1/2 backing of foam board. Both of these backings allow for a vinyl application to be applied to the foam board sign and sometimes the foam board is laminated to give it a shiny coat. for a better display. The vinyl prints that are applied to the foam core board are full color, meaning that you can have a variety of colors on it and are not limited to certain colors. In addition, you can have pictures and logos printed on the foam board as well. Some of the newer flat bed printers can print directly on the foam board, but it ads no special clarity or quality to the print. Las Vegas foam board signs are also popular at conventions and trade shows in Las Vegas. More trade shows, exhibits and conventions are held in Las Vegas that any other place in the United States. The foam boards are used in their visual presentations of the products and services along with the very popular banners that act as a backdrop at the conventions. These foam boards are not expensive and can be used over at other shows as well. The pricing for Las Vegas foam board signs are competitive at a range of $4 a square foot to $7.00 a foot. Many people attending conventions prefer to have their foam boards made in Las Vegas in order to make sure there is no damage to the foam boards enroot to Las Vegas. The foam boards are fragile and can easily be scuffed and will not show as well as you would normally like.